Antoine Wiertz was a 19th century painter, sculptor and writer. He was one of the most controversial artists of his time, with bizarre themes and unusual painting methods. 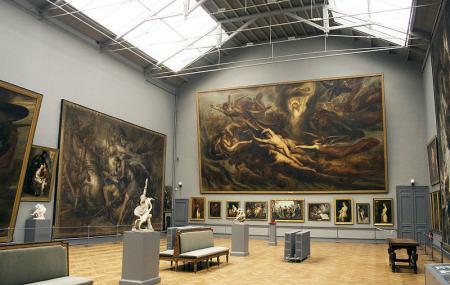 This museum, which houses a majority of his works, is part of the Royal Museums of Fine Arts of Belgium. Some have said Wiertz is the worst painter to have an exclusive a government-funded museum. That said, his works are certainly startling, and he was a prolific artist, painting many gigantic canvasses. Who knows, you may just like him. How popular is Musee Wiertz? The phrase "hidden treasure" is overused, but in this case is entirely justified. Don't come expecting Old Masters: the museum only has works by a single artist, but Antoine Wiertz painted such a huge variety of paintings, all of which are incredibly strange, it feels like you're seeing painting by dozens of different people. Because it's not widely advertised, you often have the place to yourself despite it being in such a prime location. As an added bonus, it's free, unlike most Belgian museums which seem to make it a point of pride to see how much they can gouge visitors for. If you only have time to visit one Brussels museum, it should be this one. Amazing museum with the most amazing host! He showed us the museum with such passion that made the visit a must see in Brussels! A must see!!!! It is a hidden treasure in Belgium with amazing and huge pieces of art with a host that turns your visit into a magic one with his passion and wisdom and it is free!!!! Lovely little museum. Not many visitors, silence. Interesting artworks! Could spend days there analysing the artworks and enjoying the silence and daylight coming through the roof. It was also for free. Definitely going back there. I love the place. Just one thing: some works are hung too high which makes it difficult to see them properly. A shame because those works are interesting too! One of the worst museums I have been to. I'm glad I got in for free because it is not worth it.